Trust adds speed to your relationships. Why is it that we’re able to authentically share with certain people in our lives, yet with others we’re very guarded when it comes to when and how we share? Conversely, why do we listen to some through a filter of skepticism or doubt, yet with others we absorb every word they say? The answer to both of these questions is quite simple. It’s called TRUST. 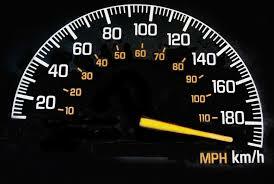 Similar to the speedometer of a vehicle, our internal trustometer measures the level of trust we have for others. The trustometer serves as a foundation for all of our relationships and greatly affects the choices we make. For example, if I have a low trustometer with a friend or colleague, I may carefully consider what I can tell this person, or what I can do around this person. Conversely, if my trustometer is high, I’m able to express myself authentically. In a sense, a high level of trust tends to add a great deal of speed to our communication. Through our behaviors, we have the ability to either accelerate or decelerate the trustometer in each of our relationships. Remember, trust is built the old fashioned way, by earning it. Don’t bother asking for it. Here are 6 things you can do to accelerate your trustometer. Perhaps the most important quality of a strong relationship is integrity. Simply put, if we do the things we said we would do, the level of trust naturally rises. I’m not just talking about showing up on time for a lunch date; I’m also referring to the inherent commitments we make in all relationships. For example, a commitment that every student makes to a teacher, with regard to homework, is to have it done on time. It’s not something that has to be “promised” each day. However, when this commitment is broken (on a consistent basis), the level of integrity greatly suffers and the teacher’s trustometer for that student is low. I’ve always said that teachers don’t make decisions based on who they like or don’t like, it’s always based on the level of trust they have for a particular student. This could also apply to the decisions parents make with regard to their children. It’s not about fairness, it’s about trust. This one is pretty self-explanatory. Even though it may hurt at times, being brutally honest in a relationship is absolutely critical to achieving increased trust. There’s a reason why we have two ears and one mouth. If you think about the high trust relationships you have today, I would bet that these individuals express a genuine interest in understanding you. The only way to understand another person is to put aside our own personal agenda and/or judgments, and simply listen. By listening to others, we are essentially conveying the message that we value who they are. There’s a quote that says, “If you have gratitude for someone and fail to express it, it’s like wrapping a gift and never giving it.” This is an awesome reminder of the power of gratitude. I used the word genuine for a reason. Sometimes people express gratitude as a means of manipulation, to get something they want. Genuine gratitude comes purely from the heart and expects nothing in return. Start right now by thanking the people in your life who influence you. As far as I’m concerned, there is nothing more devastating to a trustometer than gossip. What we sometimes fail to realize is that when we choose to gossip, we are essentially telling the person we are speaking to, “It’s highly likely that I will gossip about you when you’re not around.” Simply put, it’s hard to trust someone who gossips. If you’d like to learn more about the trustometer, or emotional intelligence in general, I invite you tune in tomorrow afternoon at 4:00 pm (PST) for my FREE webinar. I was chosen as one of 70 emotional intelligence experts from around the world to present as part of Vitality – EQ Week, a worldwide forum for promoting the power of EQ. Click here to register for this FREE webinar. You can also register for the “recording only” version, which will be sent directly to your email following the webinar. Thanks for your support.